Gerwyn Price sits at the bottom of the league table and is still searching for his first Premier League win. Last week he looked set to break his duck when he led 5-3 against Van Barneveld, but he went on to lose four legs in a row and was defeated 7-5. Perhaps worryingly for Price, his match average of 89.01 against Barney was his lowest average of the Premier League season. He also failed to hit a 180 during the match for the first time in this year’s tournament. Price has the lowest overall tournament average of all ten competitors and he has yet to have a match average of over 94 during the opening five rounds of the tournament. Michael van Gerwen moved to the top of the table following his 7-4 win against Simon Whitlock last week in Leeds. Since losing to Peter Wright on night two, he has defeated Anderson, Gurney and Whitlock. His performance against Whitlock wasn’t a vintage Van Gerwen display but was still good enough by most standards. His match average of 100.2 and checkout percentage of 30.4% were his lowest match totals so far during the 2018 Premier League. Van Gerwen has averaged over 100 in each of the opening five nights of the 2018 Premier League, and his tournament average of 103.04 is comfortably the best in the league, as is his first-nine dart average of 112.85. Top of the league plays bottom of the league in this match-up. 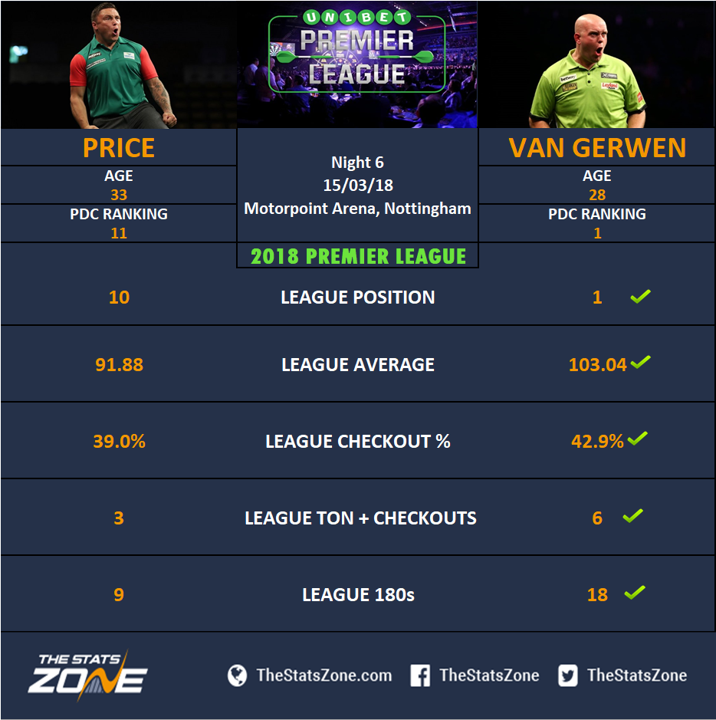 Gerwyn Price has had a difficult debut season in the Premier League and it does not get any easier with a clash against the very best player in the business. Michael van Gerwen has totally dominated their previous meetings having won on all 12 occasions and it would be a huge shock if that stat didn’t read 13 wins out of 13 at the end of this encounter. Price did push Van Gerwen hard when they met at the 2018 PDC World Championship but that performance from Price will only motivate Van Gerwen even more to make sure he doesn’t slip up here. It’s hard to see anything other than a win for Mighty Mike.